Twice a month our writer cooks from the book and decides if these farm-to-table recipes are worth the investment. Ina Garten’s appeal is two-fold: she’s a jovial-but-firm kitchen taskmaster, but is also a complete enabler when it comes to upping the butter, sugar and salt content of your diet. Note that of her 11 books, there is no “Barefoot Contessa Light” to be found. Her new book, Cook Like a Pro (Clarkson Potter; $35) is a complement to her latest television series of the same name, and is focused on helping you achieve professional results at home through both her famously rock-solid recipes and helpful cooking tips. The recipes are for when you have company over, because presumably, if you’re going to cook like a pro, you want to impress people other than your family. Think filet of beef, eggplant Parmesan and panna cotta. Interspersed among the recipes are sections on measuring ingredients, choosing the right knife, baking techniques, etc. Like most things from the ‘80s, Chicken Marbella seems to be making a comeback. I tackled Ina’s updated version which brings together the seemingly bizarre combination of chicken pieces, prunes, green olives, capers, dried oregano and garlic. The chicken is marinated overnight for maximum flavor, then baked surrounded by white wine and with brown sugar sprinkled on top. The result was a bewitchingly complex mix of salty, sweet and sour deliciousness, if actually a little too sweet for my personal taste. It’s an accepted fact that the main thing standing between your own home cooking and those dishes you order in a restaurant is the extra salt and butter they add. So if you’re cooking from an Ina Garten recipe, you’re already pretty close to cooking like a pro. 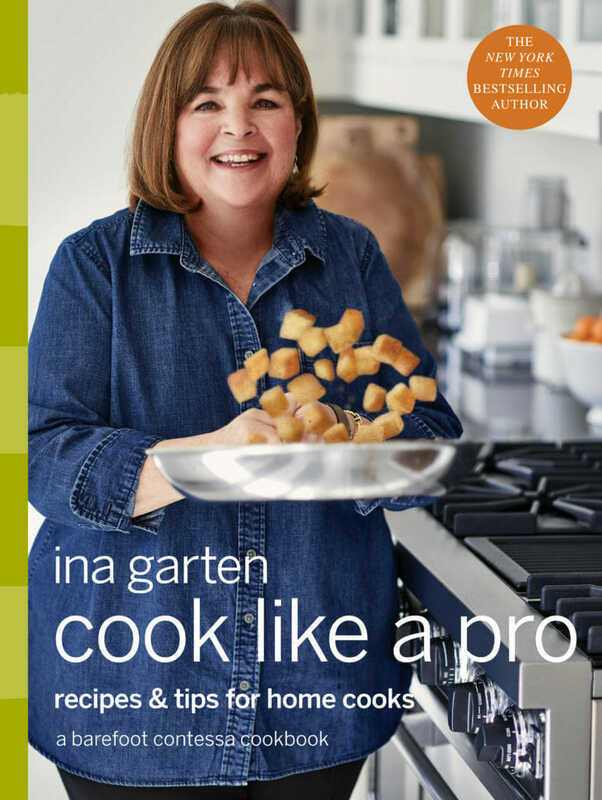 If your bookshelf is home to a collection of Barefoot Contessa books, you can probably skip this—just open any one of them and follow the recipe to a T. Instead, go out and buy Cook Like a Pro for someone new(ish) to the kitchen, because this is a great intro to Ina and her classic recipes. Wendy Underwood tests out cookbooks weekly on Instagram at @kitchenvscookbook. Okay, I have a thing about scones. When they’re good, they’re light and flaky and full of flavor. Be sure to use really good chocolate that you dice by hand so there are puddles of melted chocolate when you bite into them. And trust me, four teaspoons of Diamond Crystal kosher salt may sound like a lot but it makes all the difference. Preheat the oven to 400 degrees. Arrange two racks evenly spaced in the oven. Line two sheet pans with parchment paper. In a small bowl, combine the 3 tablespoons flour with the chocolate and pecans and set aside. In the bowl of an electric mixer fitted with the paddle attachment, combine the 4 cups flour, the sugar, baking powder, and salt. Add the butter and, with the mixer on low speed, blend until the butter is the size of peas. Measure the cream in a 2-cup glass measuring cup, add the eggs, and beat until combined. With the mixer still on low, pour the wet mixture into the dry mixture and combine just until blended. Add the chocolate and pecan mixture and mix just until combined. The dough will be very sticky. Dump the dough out onto a very well-floured surface and knead it a few times to be sure the chocolate and pecans are well distributed, adding a little flour so the dough doesn’t stick to the board. Flour your hands and a rolling pin and roll the dough ¾ to 1 inch thick. You should see lumps of butter in the dough. 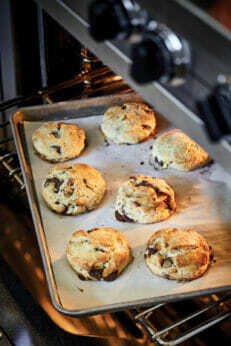 Cut the dough with a 3-inch plain round cutter and place the scones on the prepared sheet pans. Reroll the scraps and cut out more scones. Brush the tops with the egg wash, sprinkle with sugar, and bake for 20 minutes, switching the pans halfway through, until the tops are lightly browned and the insides are fully baked. Serve warm or at room temperature. The French chef Joël Robuchon has been known to say he limits his dishes to no more than three dominant flavors so you appreciate the intrinsic flavors of a dish. Of course, I’m sure he didn’t mean that literally, because some subtle flavorings simply make other ingredients taste better, but I like his philosophy. 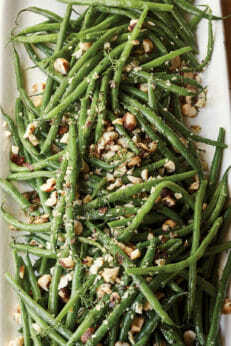 Here I flavor French string beans with toasted hazelnuts and fresh dill, and I think they all work really well together. Place the hazelnuts in a large (12-inch) sauté pan set over medium heat. Cook for 5 to 10 minutes, rolling them around occasionally, until they are heated through. Transfer the nuts to a clean kitchen towel, fold the towel over, and roll them around until some of the skins fall off. (Don’t worry if they don’t all fall off.) Roughly chop the hazelnuts and set aside. Wipe out the pan with a kitchen towel. Nora Ephron once commented that in the 1980s whenever you went to a dinner party in New York City, everyone served Chicken Marbella, from The Silver Palate Cookbook. This chicken is marinated with prunes, olives, capers, and a stunning amount of garlic. There’s a reason it was so popular; it’s full of big flavors and is so easy to make. I revisited the old recipe, tweaking the flavors a little, and it’s better than ever! Combine the olive oil, vinegar, prunes, olives, capers, bay leaves, garlic, oregano, 2 tablespoons salt, and 2 teaspoons pepper in a large bowl. Add the chicken to the marinade. (You can also place the chicken and marinade in a 2-gallon plastic storage bag and squeeze out the air to make sure the chicken is fully covered with the marinade.) Refrigerate overnight, turning occasionally to be sure the marinade is getting into all of the chicken pieces. 2 teaspoons salt, and 1 teaspoon pepper, and pour the wine around (not over!) the chicken. Roast for 45 to 55 minutes, until the internal temperature of the chicken is 145 degrees. Remove the pan from the oven, cover tightly with aluminum foil, and allow to rest for 10 to 15 minutes. Discard the bay leaves. 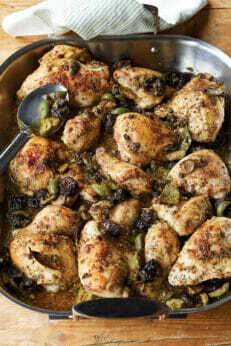 Transfer the chicken, prunes, and olives to a serving platter, sprinkle with salt, and serve hot with the pan juices.